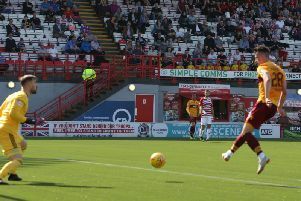 Motherwell FC’s terrific runs to both major cup finals last season helped bring about record turnover of £6.84 million and record profit of £1.72 million, writes Craig Goldthorp. The remarkable figures to May 2018 – a major feather in the cap for the Motherwell board and management team – were also helped markedly by the £1.03 million received from the player sales of Ben Heneghan to Sheffield United and Louis Moult to Preston North End. A clearly delighted Motherwell chief executive Alan Burrows posted on Twitter: “Just a quick note of acknowledgement and thanks to all the brilliant staff at the club who have worked so hard to help us achieve these results. The 2017-2018 season was a remarkable one for the Steelmen under the stewardship of Burrows, manager Stephen Robinson and his assistant Keith Lasley. The qualification for both the Betfred and William Hill Cup finals was the first time that the claret and amber side had reached both national finals for 67 years. As turnover increased by £2.65 million and profit by £1.9 million from the previous season, ’Well also finished a respectable seventh in the Scottish Premiership. There were notable increases in gate receipts, sponsorship and advertising, commercial and broadcasting rights. The club, along with its fellow Premiership counterparts, continued to benefit from significant UEFA solidarity payments as a result of Celtic’s progression into the UEFA Champions League group stages. The payments received were in line with the previous year. Costs increased by £1.35 million, with investments on the pitch, replacing the John Hunter Stand roof and South Stand scoreboard. There is also a new online ticketing system and club website, with debt owed to John Boyle and Les Hutchison reduced by a combined £545,000.